When it comes to protecting you and your family, you want the best. Perhaps you've invested in a security system for your home. Likely, you have health insurance. Hey, your dog probably has health insurance. You make safety efforts in almost every aspect of your life, so why wouldn't you want protective qualities in your car? A two-ton steel vehicle needs high-tech safety components. SUVs are no exception. Your Mercedes SUV may have welfare features that you aren't even aware of. Check out the top five safety features of your SUV. Due to the center of gravity, larger vehicles are susceptible to rollover. That's why stability control components are so important. Luxury SUVs come equipped with this basic feature. 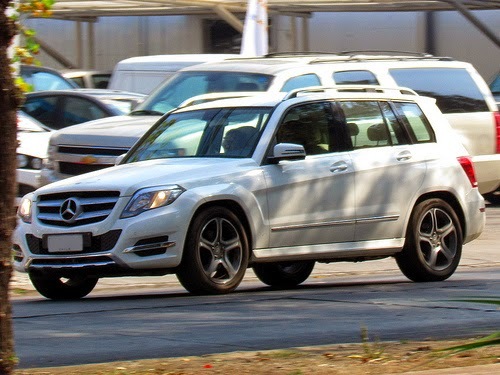 Car and Driver tests found that the Mercedes-Benz GL-Class vehicle, "Might be the most restrictive stability-control program this tester has encountered. Achieving max grip is as easy as flooring the throttle and turning the wheel. Electronics keep the wagon upright." Rest assured, if you take an unexpected sharp turn, stability control will have your back. Blind Spot Assist is the kind of futuristic feature you'd expect from a top-of-the-line SUV. A large vehicle often comes with decreased visibility. That's why an extra set of electronic eyes is so necessary. According to Mercedes, "When radar sensors in the rear bumper detect that a vehicle is alongside yours, a red icon lights up in the side mirror to let you know." Staying aware of the cars around you helps to keep you in control. Blind Spot Assist ensures you're informed of your fellow drivers at all times—from all angles. Lane Keeping Assist works together with blind spot protection for additional safety. J.D Power tests note that Lane Keeping Assist actively identifies situations where your vehicle may inadvertently drift out of the current lane. The technology applies slight and selective braking to avoid an accident. It's a feature that accounts for unexpected distractions that could result in major mishaps. Lane Keeping Assist and Blind Spot Assist are must-have highway safety features. Accidents that occur at the highest speeds often result in the greatest tragedies. Without these extra details, you may find there's more to worry about on the road. Pre-Safe is like a crystal ball for your car's computer. It's a predictive system that uses sensors to foretell and react to an impending accident. In the moments leading up to an accident, certain activity—such as skidding—can warn the Pre-Safe system. Your car becomes your guardian angel in the moments before a crash. According to Mercedes, "It then tightens the front seat belts, adjusts the front head restraints and passenger seat, and can even close the windows and sunroof, all to better prepare the occupants for more effective results from the restraint systems." These extra details could mean the difference of a cushion or a brick when it comes to impact. In the same way Brake Assist and Lane Keeping Assist work together, so do Pre-Safe and Distronic Plus. In fact, on some level, all of your SUVs safety features work together. The Distronic Plus system uses sensors to see ahead of your car to predict traffic patterns that might cause unexpected breaking. It's the moment that danger is sensed that Pre-Safe kicks in. The manufacturer notes, "PRE-SAFE Brake feature automatically initiates up to 40 percent braking power, audibly alerts the driver, and engages the PRE-SAFE system. When the driver brakes, 100 percent braking pressure is instantly applied." In some cases, full brake pressure can be applied if the driver doesn't react to the initial Pre-Safe security measures. Carefully curated safety features can act as a figurative force field around your car, protecting you and your family from the unexpected dangers of the road. Mercedes SUVs come equipped with and offer options for state-of-the-art safety technology. It's time to get on board. What's your must-have safety feature? Which feature could you do without? Share your thoughts in the comments below.